Welcome back to the Knowledge Pool! My last two articles focused on decks aiming to do “big” things, and have been inspired by decks I’ve personally built in real life. This week, I want to go in a different strategic direction, and focus on a commander that’s new to me. As Dominaria spoilers begin to surface, and we begin to anticipate all the new legends we’ll get to experiment with, I wanted to reflect on the Ixalan block and one of the tribes that I feel doesn’t get the love it deserves. Like most Magic players, I couldn’t have been more excited about the prospect of Dinosaurs and Pirates in Ixalan, and while both tribes got tons of new cards, Dinos seemed to end up more appealing to Commander players. A quick look at EDHREC shows that Gishath, Sun’s Avatar helms 434 decks as of the writing of this article, while Admiral Beckett Brass is the commander of 232, a difference of just over 200 decks. Not bad. These three pirates actually offer us Raid triggers that either scales with the board, Protean Raider, or offer us continued value with each attack, Marauding Looter and Ruin Raider. Unfortunately, these three represent the best that Raid has to offer for pirates, and the gap between these and the next best Raid options is wide. What’s more damning is that Protean Raider doesn’t maintain its pirate typing once it’s copied another creature, making it a difficult inclusion in a pirate focused deck. While there are other pirates that offer us attack triggers, its fair to say that the Raid mechanic is not what is enticing us to play this tribe. 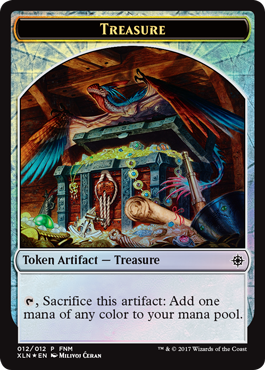 Treasure is the other pirate mechanic offered by the Ixalan block, and involves the creation of artifact tokens that can be sacrificed for mana. Treasure is a powerful mechanic that can represent a discount on the cards that make it, and can allow us cash in on later turns to cast bigger spells. Conceptually, Treasure is a conflicting mechanic for pirates outside of flavor considerations. Most of the best pirates are costed between 2-4 mana, so unless we are mana screwed, treasure is not going to be worth spending on pirates themselves. This being said, Treasure offers pirates reach they would ordinarily lack in the ramp limited Grixis colors. Because of Treasure, Pirates can afford to play some bigger spells in their decks with the reasonable expectation that they may be able to cast them without too much trouble. It should also be noted that Treasure provides pirates with a source of dispensable artifacts that could be combined with cards like Goblin Welder or Reshape for the addition of an artifact theme in a Pirate deck. Of the two signature Pirate mechanics, Treasure presents a more enticing opportunity in Commander, allowing us to circumvent some of the constraints that might otherwise hinder a deck in the Grixis colors. 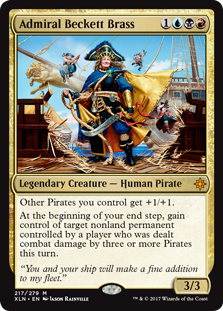 While the pirate mechanics are lack-luster from a tribe perspective, the second, and more crucial, deficiency is the commander: Admiral Beckett Brass. Brass is not the only legendary pirate, however she is the only legendary pirate with the Grixis color identity. Her first ability offers an effect that boosts the power and toughness of other pirates, and while not exciting, most pirates are on the smaller side, so the anthem is appreciated. Her second ability rewards us for dealing damage to an opponent with our pirates, allowing us steal a nonland permanent. This ability has potential, but it’s more challenging to activate than it appears. Pirates do not have many token generators, so we won’t have the luxury of going wide or dealing our damage through more dispensable sources. In addition, we need at least three of our pirates to connect with an opponent, which is challenging in a format dominated by creatures. These two abilities make Brass a very fair commander. She doesn’t provide us the tools to quickly overpower our opponents, and even if we manage to steal from our opponents, it likely won’t be enough to dramatically influence the outcome of the game. So where do these considerations leave us if we want to build a pirate themed commander deck? There are several directions we can take, one of which is outlined by fellow EDHREC writer Sam Alpert here. Sam’s design focuses on stealing our opponents’ things, a very flavorful and powerful direction indeed. I want to focus on the pirates themselves, and making the most of their mechanics. The low cost of pirates and Brass herself encourage us to take an aggressive approach to deck building, and I think we can approach the deck with the intent to capitalize on attack triggers and anthems. As always, I like to establish goals for my decks to help focus deck building, and for our pirate deck it can be summed as such: we intend to win most games through combat and going wide with our creatures. We will amass card and board advantage with attack and combat triggers. We will focus on Treasure to push us towards our win-conditions. Unlike my previous articles, this deck will take our commander, Beckett Brass, into consideration, but she will not be the star of the show. Aggressive decks are difficult to build and play correctly in Commander. In a four player game, aggro decks often can’t equally pressure their opponents, and with players having 40 life little creatures simply won’t deal enough damage. We’re also particularly soft to opposing armies aiming to go wide, and wraths eliminating our hard work. Keeping these difficulties in mind will help ensure that we build necessary answers into our deck to give us the best possible chance at success. Our deck includes 27 pirates, and of these only three cost more than 4 mana. Despite their small size, many pirates are blessed with some form of evasion including Flying, Menace, Deathtouch, or unblockability. These traits will make our creatures difficult to block, and will allow us to reliably attack so that we always have a means of establishing pressure. Luckily, focusing heavily on pirates as a tribe provides us a variety of options for increasing our damage output. We have 8 options that will make going wide with a pirate option appealing. Metallic Mimic and Adaptive Automaton are honorary pirates in our army, and both can be played early without concern for our three color manabase. These two will be our best options for applying pressure early, and they will curve nicely into Beckett Brass or Dire Fleet Neckbreaker for a massive power enhancement. Dire Fleet Ravager can follow up either of these to take a chunk out of each of our enemies, and soften them for our onslaught. Shared Animosity, Door of Destinies, and Vanquisher’s Banner also reward us for focusing heavily on pirates. If we have an established board presence, dropping Shared Animosity will make our pirates gigantic. Both Door and Banner allow us to play around our worst scenario – when our board gets wiped. Door will maintain its counters meaning that each new pirate we play will be large regardless of our board state, and Vanquisher’s Banner will help us dig towards more threats to prepare for removal. Marchesa, the Black Rose is maybe the best removal insurance we have, and plays nicely with Mimic. Not only will the Black Rose allow us to pump our team, but she will also protect our pirates once they get counters. Marchesa also makes a fun alternate commander if you’re looking to mix things up. I want to make special note of Angrath’s Marauders. The non-symmetric nature of this card makes it potentially our most important outlet for extra power, and it can easily be considered one of our win conditions. I would recommend saving the Marauders for an alpha strike to provide opponents the smallest window to present an answer before facing our cannons. Beyond pumping our team, this deck includes several pieces of equipment to both protect our pirates and make them hit harder. Sword of Fire and Ice and Sword of Feast and Famine guarantee us value whenever one of our pirates connect, and will help us cut through gummed up board states. Additionally, Trophy Mage and Deadeye Quartermaster will make both of these cards more easily accessible, and can also carry the swords themselves. While evasion is one of the stronger natural aspects of pirates, it’s in our best interest to include a few cards to ensure our army can penetrate in case we end up against flyers or a token army. Removal will remove the things in our way, and while everyone knows the power of Cyclonic Rift, pirates have a potent tribe focused spell as well. Fiery Cannonade is an instant speed answer to a token army, while avoiding almost all the creatures in our deck. 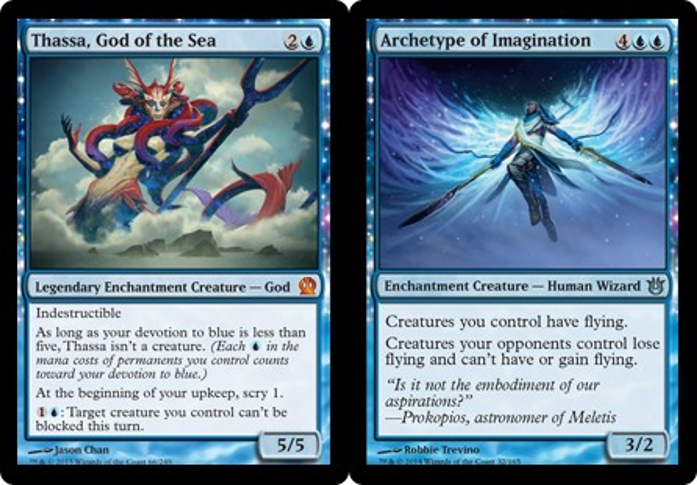 Thassa, God of the Sea is a perfect inclusion in this deck mechanically and flavorfully. Her scry ability is always welcome, but her targeted unblockability is the primary selling point. Archetype of Imagination is included for the same reason. If we’ve established a couple of our pump spells, Archetype will represent a ton of damage, and will be a prime option for closing out a game. Of these, Daring Saboteur, Ruin Raider, Bident of Thassa, and Kindred Discovery all represent forms card selection or card draw. In particular, we can make the most of Discovery since we will draw cards off of every pirate we play and every pirate that attacks – they don’t even need to deal damage! Captain Lannery Storm and Storm the Vault are our first cards relating to our Treasure subtheme, and both make the best of the evasion and pumps we’ve built into our aggressive strategy. The flip side of Vault will also reward us with tons of mana for including other treasure makers. To this point I’ve been referring to pirates as a means to an end; bodies that we can pump and send pounding into our opponents. What I’ve neglected to mention is how many unique abilities pirates have. These abilities make building a pirate deck a challenge: we sacrifice tribe cohesion for variety. Of these Fathom Fleet Captain gives us a taste of a pirate token army, rewarding us for our pirate loyalty, and giving us more evasive bodies for pushing damage. Warkite Marauder has natural evasion, and is one of our most useful pirates for its ability to potentially shrink and invalidate any huge monsters we might be up against. Dire Fleet Poisoner and Fathom Fleet Cutthroat serve as removal, and once our opponents know they’re in our deck, they’ll be a lot more wary of blocking our army even under favorable conditions. So far I’ve only briefly touched on our Treasure sub-theme. While there are wide variety of Treasure makers, I focused on the cards that would either present us a consistent stream of Treasure or else cards where Treasure was included with other important abilities. Treasure Map offers a good early game play, allowing us to set up future turns, and late game representing a means of digging for answers. Ruthless Knave provides similar utility for converting Treasure to card draw, but also acts as a valuable sac-outlet if our creatures are going to be dying anyway. Pitiless Plunderer also rewards us when our creatures are dying, acting as pseudo wrath insurance as he sees our other pirates die. Deadeye Plunderers is a mana-sink, and will usually be rather large thanks to the 15 natural artifacts in the deck. Revel in Riches and Mechanized Production should provide us a continuous stream of Treasure if we can make either stick, and also serve as ambitious alternative win-conditions should we fail on the combat front. I pointed out how crucial it is for us to factor in protection when working with an aggressive deck. Often the best thing we can do is play conservatively, and not overextend in an early push. I’ve pointed out a few potential answers we have like Marchesa, the Black Rose and Pitiless Plunderer, but I’ve also been sure to include pieces more dedicated to protecting our fleet. The most straightforward protection in our arsenal is recursion. This is not a recursion focused deck (although it could be…), but Phyrexian Reclamation offers us a cheap and consistent means of bringing back any of our lost sailors. After a wrath or two, a late-game Patriarch’s Bidding provides us an army out of nowhere, and sometimes will be a game-winning maneuver. It’s important to remember that Bidding is a symmetric effect, and that we’re attempting to break symmetry by getting more value than our opponents. If a player at your table is playing another tribal deck Bidding can cause more damage than good, so be observant! Counterspells are not a primary theme for this deck, but I like having a few to keep our opponents honest. Siren Stormtamer is everything we could hope for in a pirate: evasive, cheap, and protects our other pirates. Counterspell is an effective answer to most things while Swan Song is a cheap and hard answer to most of the spells that are going to cause us issues. Spell Swindle is more expensive than most of the counterspells I would normally run, but the potential to amass a ton of Treasure out of nowhere could be game-changing. Finally, we can embrace our pirates dying by playing Vicious Shadows. By playing Shadows we’ve put a clock on all of our opponents, and make wraths and blocking a non-option for dealing with us. We’ve covered most of the important strategies in the deck, which leaves me with a handful of miscellaneous pirates. Dire Fleet Daredevil, Captivating Crew, Kitesail Freebooter, and Hostage Taker give us a few opportunities to steal our opponents things. Daredevil can be whatever we need it to be: removal, ramp, etc., while Crew and Taker serve as pseudo removal. Freebooter is not at its best in commander, but the fact that it has natural evasion, and can potentially strip away a removal spell from an opponent adds to its utility. Forerunner of the Coalition is a godsend for this deck, giving us a thematic means of locating our most important cards like Angrath Marauders. Finally, Crafty Cutpurse gives us a unique answer to token decks by stealing all the dudes that might get in our way. I understand how fragile this combo is, and how it’s not a reliable win condition, but I couldn’t resist including a pirate-based infinite combo in this deck. Late in the game, when removal is used up, you may be able to pull it off and bring victory to your fleet. I want to thank you all for going on this journey with me. Pirates have their flaws as a tribe, but I believe they can present a potent threat at a table of opponents with 75% theory decks. From here, there are tons of other pirates and tribal spells that could be fit into this deck. Deadeye Tracker is an awesome choice in a graveyard heavy meta, while Dire Fleet Captain could add some punch to your early drops. There are also a lot of additional Treasure generators if you would like to take that theme to the next level. Like any untested deck, tinkering will help improve the consistency of this deck. Perhaps more ramp or mana would be valuable, or maybe a heavier focus on removal is important. Let me know if you have any of you have first hand experience with Brass as a commander, and if there’s anything I’ve missed! For the rest of you, I hope I’ve inspired you to give pirates a chance. Until next time, I wish you all the best, and happy brewing! I'm a Timmy that loves Green, Creatures, and Lands. I prefer controlled smashing, and best associate with the Temur colors. I've been playing commander since 2012, and I spend my free time brewing decks and exploring new strategies. I'm also a sports nut, and follow baseball, football, hockey, and soccer in detail.